What is the Developer Package? This Brand Free Readymade Scripts gives you an every single penny that you can earn by selling the websites is yours, when you buy this Multi-Domain Readymade PHP Scripts you are ready to sell with full rights. Get Bonus Script! 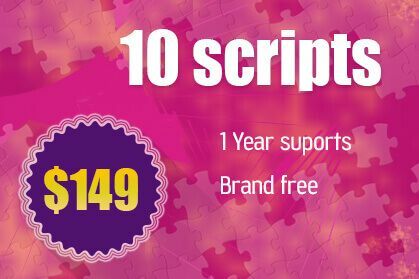 If you Buy this Package Within a Week You Will Get Additional 3 Script for free. No technical knowledge required at all for running this business. Only WordPress Accessing skills enough to do. 1 Year Support 6 Months Update and Brand free ! If you found the right script from right author (Of course with best support), scripts mall is the best choice always. You got a variety of script in most of all categories. Following script is amazing! I recently bought my script and had no problems! Easy documentation steps for beginners.